This week, we are working on the final preparations for our Thursday evening event. The event ties-in with the BBC’s Who Do You Think You Are? programme featuring Mary Berry which aired on Thursday, 11 September. Some of the research took place in the Norfolk Record Office. If you watched the show, you may have seen the film crews visit our Conservation Studio and our Strongroom, while Joanne Penn, revealed that one of Mary’s ancestors gave birth to four illegitimate children. Both of these rooms will be included in our behind-the-scenes tours during the evening. In addition, we will have talks by two local record searchers who worked on the programme. 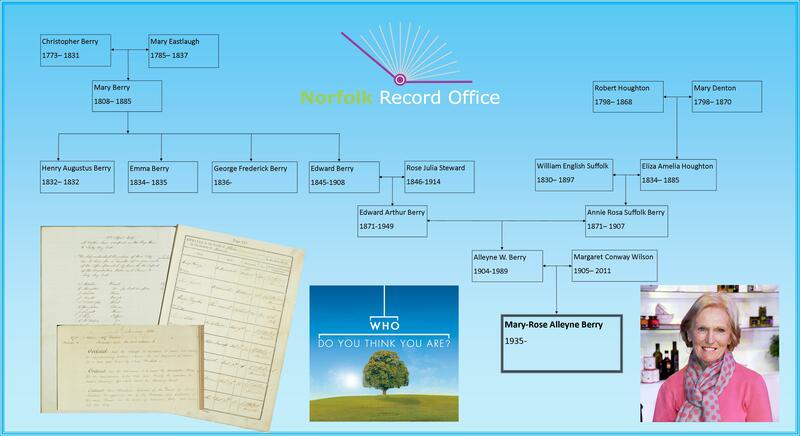 ‘Who’s on the Cutting Room Floor?’ by Joanne Penn will give you a chance to find out about a few more of Mary Berry’s fascinating Norwich ancestors. While ‘Life in context’ by Gill Blanchard will tell you more about the research into the occupations and local history for the show, and show you how these documents can help in discovering your own family history. Staff at the Norfolk Record Office are also spending their evenings this week baking cakes which will be available on the evening (many using Mary Berry recipes), and all donations will go to Macmillan. It looks set to be a busy and interesting evening, we hope to see you there. This entry was posted in Events and tagged family history, Mary Berry, research, television, Who Do You Think You Are?. Bookmark the permalink.